The Forward has published its annual list of America’s 50 most important Jews: the Forward 50. 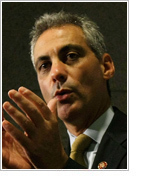 Winners include Rahm Emanuel, Obama’s newly appointed Chief of Staff, about whom you can read here. There’s also Morris Allen, a Conservative Rabbi from Minnesota who helped re-invent kashrut as a moral rather than merely legal imperative, just as Agriprocessors, America’s largest kosher meat producer, sunk deeper and deeper into sin, exploitation and eventually, bankruptcy.